Faster Horses Fridays at Milnes! Faster Horses Fridays is back with your chance to win tickets to the biggest 3 day concert event of the summer! Every Friday in April NASH FM 95.1 will be live with your chance to win a pair of 3 day passes to the Faster Horses Festival. 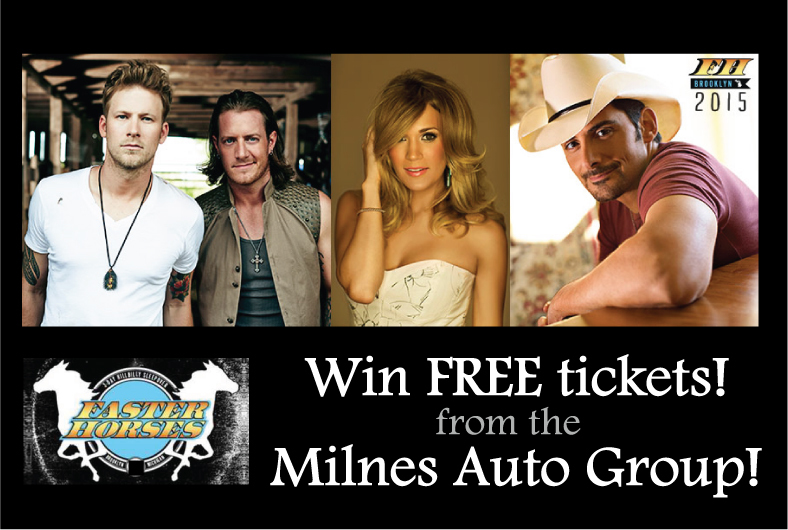 Ask Tim and April how to increase your chances of winning during Faster Horses Festival stops. The line up continues to get better and better which features Carrie Underwood, Brad Paisley and Florida Georgia Line. Below are the dates and times you can get yourself entered to win. It’s all brought to you by the Milnes Automotive Group. 0 comment(s) so far on Faster Horses Fridays at Milnes!